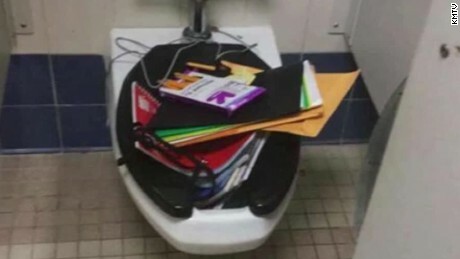 He never walked into a school cafeteria and had other students stare as he opened his lunch — that is, until fifth grade. A craniofacial disorder refers to an abnormality of the face or head, according to the Children’s Craniofacial Association, a nonprofit dedicated to empowering individuals and families affected by facial differences. Shane and Emily are both involved in the group. Shane was diagnosed at 18 months with the genetic facial disorder Crouzon syndrome. He attended the San Diego premiere of “Wonder” and said that his favorite scenes were of Auggie jumping on the bed and playing Minecraft — scenes in which Auggie was just like any other kid. Emily was diagnosed at 3 weeks old with the rare congenital facial condition Goldenhar syndrome, and similar to Auggie, she has had more than 20 surgeries. Emily has read the “Wonder” novel “at least 30 times,” said her mother, Nancy Merrill, and the family planned to host a screening of the movie over the weekend. A lot of the “Wonder” storyline fits into Shane Vysocky’s life. Shane started first grade this fall, and he had everything he wanted for his first day of school: his backpack, his lunch and a black-and-white copy of his most recent CT scan. In the summer months, Shane was recovering from surgery and wore a metal “halo” ring around his head that helped pull his cheekbones and upper jaw forward. That summer, he had a lot of CT scans taken. Due to Crouzon syndrome, Shane’s skull didn’t grow normally when he was an infant. It affected the shape of his head, face and ears, causing a hearing impairment for which he wears hearing aids. Shane had two surgeries as a baby and then reconstructive surgery on his skull when he was 3. 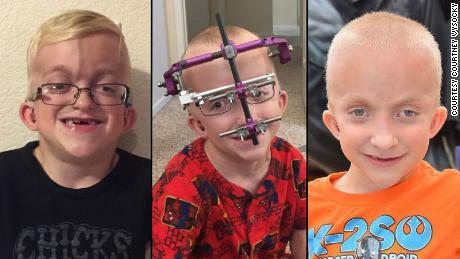 He had another surgery when he was 6, followed by wearing the “halo” device for four months. The device was removed in August, and Shane brought it to school to share his medical journey with his classmates. “I like when we can show things to other people, to show what we found and what we’ve gone through,” Shane said. 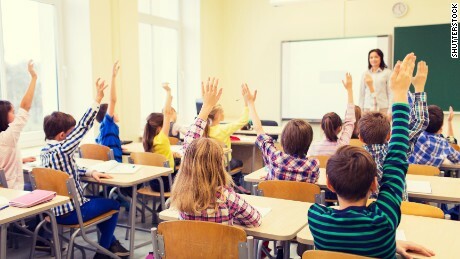 On that first day of school, Shane’s classmates’ small hands shot into the air so they could ask him questions about the device. “How did you sleep with that thing on? Did you take it off when you took a shower?” they asked. “He had some pretty funny answers like, ‘No, it’s screwed to my skull. I couldn’t take it off!’ ” his father said. Shane’s confidence in answering questions about his facial difference might stem from how he is treated at home, Vysocky said. “We’ve never treated Shane like he was any different. He has the same rules as any other kid. You know, he has to clean his plate, all those things,” Vysocky said. 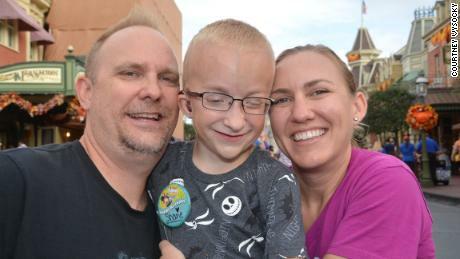 Living in Southern California, Shane enjoys going to Disneyland with his family — he takes pride in the fact that, at 48 inches tall, he now can ride all of the roller coasters — and riding bikes with the kids in his neighborhood, Vysocky said. “In our neighborhood, we have a lot of other kids that are in his age range, and not one has ever looked at him differently,” Vysocky said. Throughout his life, family and friends in Shane’s school and neighborhood have surrounded him with support. Bullying has not been an issue, Vysocky said. Yet when it comes to bullying, Shane’s mother, Courtney, said that the parents of children without facial differences can help prevent bullying before it happens. “It really has to come from whoever those adults are in a child’s life, having that conversation about how to interact with people who maybe don’t look the same as you,” Courtney Vysocky said. “Shane’s fine if you ask him, ‘Hey, what are those things in your ears?’ But to just point and stare and give him a disgusted look, that’s a very different feeling and a very different interaction than a kid looking at him but then saying, ‘Hey, what is that?’ ” she said. As for 13-year-old Emily Merrill, bullying has not been much of an issue for her, either. Her mother, Nancy, credits her school district, Tinton Falls School District in New Jersey, for that. But similar to other children with facial differences, Emily has long been aware of her face and how the outside world responds to it. 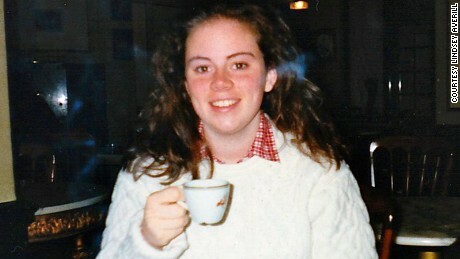 On a cold January day in 2004, Nancy Merrill and her husband, Gary, met Emily face-to-face for the first time. After giving birth, Merrill cradled her newborn 6-pound, 11-ounce daughter in her arms. She was so infatuated with her baby girl that she didn’t notice the confusion and concern on the faces of the physicians in the room. Emily was born with skin tags around both of her ears and no lower jaw mandible, which makes it difficult for her to hear and eat, Merrill said, but when she was born, her doctors couldn’t determine her medical diagnosis, and they didn’t know what to do. So they sent Merrill and her family to Children’s Hospital of Philadelphia, where Emily was diagnosed with Goldenhar syndrome. It’s so rare that it’s estimated to occur in 1 per 3,500 to 25,000 births, according to the National Institutes of Health. Emily has had multiple surgeries on her mandible, face and ears. She received a cochlear implant in July to treat her single-sided deafness in her right ear, Merrill said. 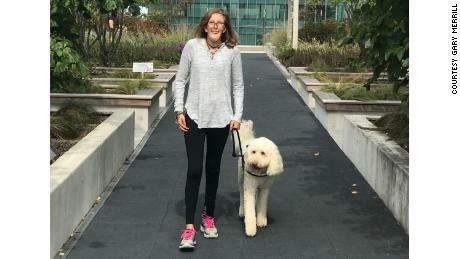 Living in the suburbs of New Jersey, Emily prefers spending quiet weekends at home playing board games with her parents and 10-year-old sister, Abigail, spending time on her iPhone, swimming or training her service dog, a 4-year-old golden Labradoodle named Hank. Emily often avoids big social events, Merrill said, except for Halloween. “Halloween tends to be another one of her favorite holidays because she can put a mask on and be quote-unquote the same as everyone else that day,” Merrill said. As for other holidays, like this upcoming Thanksgiving, Merrill said it breaks her heart in “3,000 pieces” that Emily won’t be able to eat a slice of cake or pumpkin pie like the other children. Yet “Wonder” has helped motivate Emily to no longer shy away from strangers’ stares and questions in public but rather to share information and educate them about her facial difference, Nancy said. In other words, “Wonder” has given Emily confidence. “She has begun to Skype with other schools, and she just did a presentation today at her school as a real-life Auggie,” Merrill said on Wednesday night. 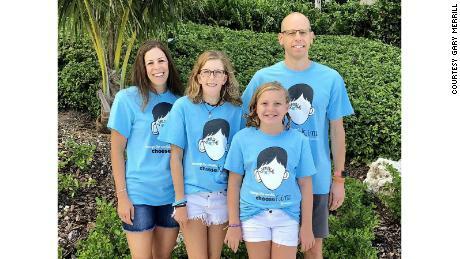 All in all, “Wonder” might shed light on how for children with craniofacial conditions and their families, social and emotional support have become an important part of medical treatment. It’s become so important that Dr. Roberto Flores, a pediatric reconstructive surgeon at NYU Langone Health, said that a psychologist sits within his medical unit to provide those services to patients with facial differences. The nonprofit organization called myFace provides the support for that psychological expertise, he said. “The implications of bullying, particularly in a child with a facial difference, it’s really powerful, because the face is how we relate to ourselves,” said Flores, the Joseph McCarthy associate professor of reconstructive plastic surgery. He has performed reconstructive surgeries on children and adults with congenital facial deformities. Flores said he and his wife took their two children and four of their children’s friends to the New York premiere of the “Wonder” film last week. Various scenes in the film, such as Auggie sitting alone in the school cafeteria, made Flores think about the challenges his own patients have faced and the importance of the film’s message: Choose to be kind to others.